Sorry this is up in the day hours, crazy weekend. But this is more or less a sneak peek in a way… the boy in panel 3 is one of the major players in my other comic I teeter away at called Postage (1st issue almost complete). Anyway, enjoy! More comics??? Scott you spoil us so. Well, I’m working on Scout now, Postage is going to be on an issue basis, nothing fancy, black and white stuff. Motokool page is almost done, too. Ooooh… I like that, too. you cant forget the Bromanater baby! I prefer Broham Lincoln. Or Brosideon, King of the Brocean! So will I be able to buy Postage in the Dapper Decorum store or are you doing that with someone else? I like the word “brofessional”. That would do well on the list. Amg. Macabroni. you made my day. the 2 bros in the first 2 panels remind me of the 2 dude from Roysboys. Broman Polanski in the Green kind looks like Namor to me. Or maybe Spock minus the super awesome Vulcan ears. I saw this, then tried grafting Tony and Chase over the two guys…. how Brotastic! and ANOTHER comic?? are you trying to make us spazz out? Wasn’t there another comic in the works about a dapper skeleton or something? Found this last night (Aussie time) and became obsessed. I think I used up most of my downloads on your comic, BUT I LOVE IT! P.S. You should do a ‘love interest’ for Monty. Oh wow, thank you for the kind words, and that’s actually a great idea. It would be tons of fun to have a love interest for Monty. 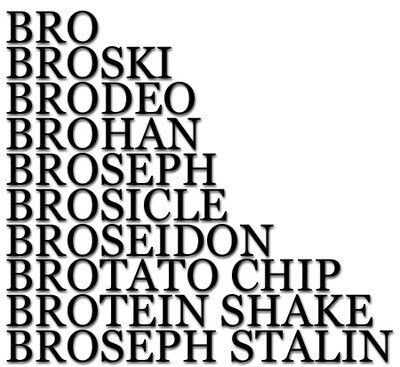 Broseph, second only to Broses in figures of the Broble.